Here at Cool McCool’s Garage, we’re always trying to keep things current, and stay “fresh”. That’s why from time to time, we like to do some “on site” reporting. Today, we are coming to you from Swannanoa NC, at “Mama Gertie’s Hideaway” campground, so startlingly steep we need ropes to keep from sliding down the hill. It’s a beautiful site though, and now that we’re getting used to the incline, we’ve decided to stay a couple more days. It certainly is nicer than the Wall-mart parking lot we stayed in the first night on the road. Our staff, accustomed to “flatland” driving, has had a little trouble acclimating, but has done well, considering the fog and rain complicating matters. Yesterday’s wait on the Blue Ridge Parkway for a wrecker to winch the wadded up remains of a rented Toyota up a cliff, crumpled luggage stacked up beside the road as the wreckage was recovered caused only a few moments of distress, and we pressed on in the fog. 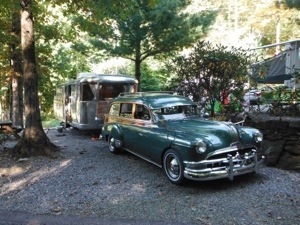 Our mobile office and support vehicle, the ’51 Tin Woody, developed a disconcerting miss, that had the entire team here worried(although we didn’t slow down), that turned out to be an unplugged vacuume port sensor, disturbed no doubt during the recent addition of the heat/defrost/air conditioner. Happily, the hundreds of Dollars worth of parts bought to throw at the problem can be returned to Advance Auto. What, me, worried? Tomorrow, more white knuckle driving and waterfall viewing is on the schedule, so stay tuned.. . Enjoying your time away. Glad to see it. Carry on. Brian, how is that wagon as a tow vehicle? 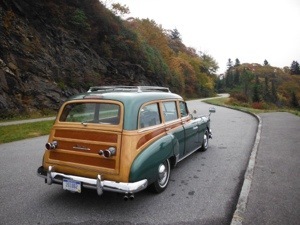 I bought Jeep Grand Wagoneer woody to tow my ’48 Spartan Manor (custom and a bit heavier than original, 4200lbs). We found that it was pretty unstable above 45-50 mph and would fish tail. I ended up towing with a Ford F-250 with no problem. I’m assuming the biggest issue is the wheelbase and mass of the tow vehicle. 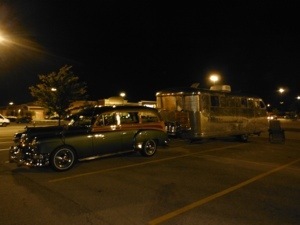 I had a weight distributing hitch on both. I absolutely love the look of your wagon pulling the Spartan! You’re right Rick, it’s the wheelbase and weight of the toe vehicle. The wagon does a good job, very comfortable at 60-65 mph, although it’s a bit shy in the horse-pressure department. Helper springs, air shocks, Reese load leveler hitch and sway control get it done. Looks beautiful there, Brian! As far as the steepness goes, Maybe the address of 15 Uphill Rd. should have been a clue? ;-D Just kidding,I took a (nighttime!) shortcut through those mountains on my way home on leave one time and it was pretty hairy!